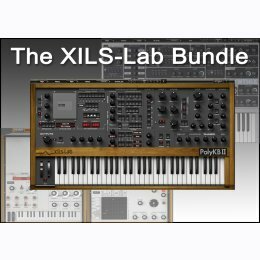 DontCrack is proud to present their exclusive bundle containing SIX great vintage synthesizer recreations by XILS-lab: XILS 4, Poly KB II, Syn'X, XILS 5 Plus, Oxium and XILS 3. The XILS 4 The XILS 4 emulates a prototype that was never released, the EMS VCS4, based on two integrated, interlinked and interacting VCS 3 ( Synthi) cores. The PolyKB II is a recreation of a very rare and very powerful polyphonic synthesizer released in the 80's by a famous french company. It is a polyphonic subtractive synthesizer based on two waveform morphing, aliasing free oscillators and a self oscillating 4 poles low pass filter. The Syn'X is inspired by a famous and legendary Synthesizer from the 80's, which a lot of talented guys used as their central Keyboard, including some synths Gurus. The XILS 5 Plus combines a Vintage 10 band Vocoder, Supreme Top Octave Divider based Strings and Human Voices, or any sophisticated layering of these three elements. The Oxium is a performance oriented synthesizer, offering both a classic pure analog sound and modern tones. with awesome real time modulations capabilities, allowing you to play a synthesizer in ways you could never have imagined. The XILS 3 is an exciting new matrix style virtual modular synthesizer. Based on the architecture of the legendary EMS VCS3 synth, the XILS 3 is capable of creating both 'classic' sounds and totally new ones. 1 Gigabyte of RAM and a 2 GHz processor. Download and TRY XILS-Labs Soft Synths demo versions before buying them !